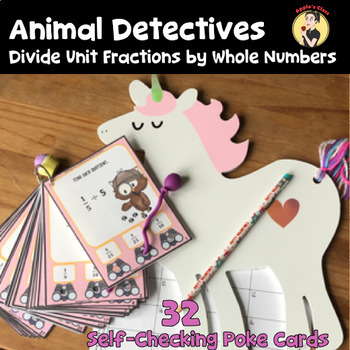 This divide unit fraction by whole number task card set is a self-checking activity for middle school math. 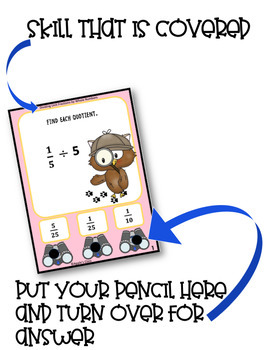 These poke cards allow students to apply their understanding of dividing unit fractions by whole numbers independently. Kids can work out problems and self-check while you work with others. For grades 4, 5, or 6th. Offers a variety of problem types for differentiation. Includes word problems. This product requires preparation ahead of time and is not editable. • Print them onto cardstock and laminate for a longer lasting product. Kids can use them in a math center this way. 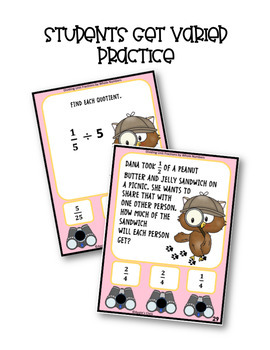 • Use them as a fun quick check lesson assessment. • Use them as a review game. 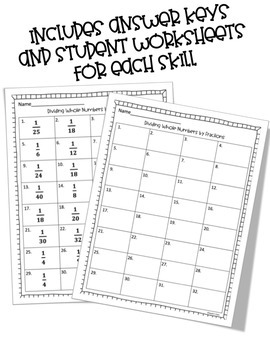 • Use them as a warm-up before a more complex lesson. • Use them as a substitute activity when you're out. Click Here To Follow Me and Be First to Know When Sales Are Coming. My followers also enjoy new products at 50% off for the first 24 hours! If you enjoy this product, please leave positive feedback to gain credits for future purchases at my store or any other store on TPT! Become familiar with your printer settings before printing this product. WASTED INK IS NO FUN! If you have questions or problems, please contact me through product Q & A so I can help. For computer or technical problems, please contact Teachers Pay Teachers. Their tech support people are amazing!